If you have heard of the Paleo diet than you know that it is a diet that is not going to go anywhere anytime soon. Thousands of people are using this diet as their way to lose weight, feel great, and get the health that they have been desperately searching for. It seems like everywhere that you look Paleo is transforming lives. People are claiming to find relief from illness, better immune systems, and more energy than they ever dreamed possible. But let’s be honest, the biggest perk of starting the Paleo diet by far is the amazing transformations that people are seeing in their bodies. People are looking younger, trimmer, and more vibrant after they start the Paleo diet. And for the first time in history normal everyday people seem to be able to get the same kind of body that only the celebrities have. Whether you have been thinking about starting a Paleo diet for a long time or you are just dipping your toe in the water, you should find your answers here. The purpose of this guide is to give you some simple ways to incorporate the Paleo diet into your everyday life. Your journey to a healthy life can be complicated, but it doesn’t have to be. Some people would like you to think that you can only get healthy if you choose to eat certain exotic foods made from hard to find ingredients. Others choose to tell you that you can only be healthy if you eat foods that are just not in your budget. But these things are not always true. The Paleo diet is a diet that is simple, a diet that is based on eating the things that you can easily find, and most importantly a diet that meets you where you are right now. When you learn how simple and easy it is to drastically change your life, you will never want to look back. And a Paleo diet is not just going to change your life, it can also change the lives of all of your family members, because eating Paleo means that you are eating for your body. Unlike so many other diets out there, a Paleo diet is healthy for everyone. Once you start eating this way, you will be amazed at the fast changes to your body, mind, and spirit. You will be able to get through your busy workday with ease, you will find you are more mentally alert than you ever thought possible, and most importantly you will feel confident because you know that you are doing something that is good for yourself and your family. Chapter 1 – What is the Paleo Diet? If you haven’t heard about the Paleo diet, you should know that it is a diet that is based mainly in nature. This is the reason that so many people are finding great success with it, because everything that they are eating comes from the earth. Everything is clean, pure, and close to its natural form. Paleo was based around eating the way that the hunter-gatherers used to eat. Before we had processed foods and television sets, people were much more healthy. In fact, you can look almost anywhere and you will see articles talking about the huge rise in obesity in the United States. Now imagine a different time. Imagine a time when there were no houses, no refrigerators, and cars. This is a time when people had to fight just to stay alive. Think about what life would have been like for a caveman. Even better, think about what your life would be like if you had to live like a caveman. Every day you would have the same tasks and every one of them would be based around survival. A caveman would do all of these things every single day of his life, that’s pretty impressive. Even more impressive is the fact that a caveman was able to do all of that and still find a way to survive nature’s harsh elements. Can you see yourself living the kind of life that the hunter-gatherers lived? These people had to rely on their strength, endurance, and skills just to make it to another day. And they were able to do this because they had healthy diets. Their diets fueled them and allowed them to keep performing at their optimum levels. The Paleo diet does not make any claims that it will allow you to climb trees or live in the woods for the rest of your life. But it does promise that it will help you to have more of the qualities that the tough caveman had. Take a second right now and think about what your life could be like if you were truly eating for your body. Imagine what you would feel like, envision what you would look like, and think about what it must be like to have the energy to get through your entire day without feeling tired. Think about what your life is like right now. If you are like most people, you get up early, go to work, come home, fix dinner, take care of the kids, clean the house, and do it all over the next day. Now what if you were able to live life a little differently? What if a few easy eating choices could help you to feel better than you ever thought possible? Imagine it, imagine your life with more energy, less hunger, and less weight. Imagine being able to jump out of bed every morning ready to start your day. Think about getting through your workday without hitting that ‘midday hump’. Imagine getting off of work, getting the kids home, making dinner, cleaning the house, and still having energy to spare. And that my friend is why so many people swear by the Paleo diet. The first thing most people want to know when they start a new eating plan is how they are supposed to take care of their kitchen. After all, your house is a part of you. Just like it takes some time for your body to adjust to you eating a new way it will also take your mind some time to adjust to changes in your home and your kitchen. We are after all creatures of habit. You are used to having your coffee pot in one spot and having your toaster in another spot. This is natural, your life. Is busy and you need a certain routine in the kitchen in order to keep up with your daily demands. But there is good news, eating a Paleo diet does not require you to buy new kitchen gadgets and you don’t need to kick out your favorite coffee pot. Eating a Paleo diet is not complicated, and it’s not tricky. In other words, a Paleo diet will fit into your life perfectly. That doesn’t meant that you want to get rid of you favorite kitchen gadgets or anything like that. Instead you want to go through your cabinets and refrigerator and get rid of anything that you will no longer need. At first, it might seem a little bit intimidating to throw out all of these foods that have been a staple in your diet for so long. But once you get rid of these foods, you will see a difference in your body and your mood before you know it. These are just a few of the things that are heavily forbidden on the Paleo diet. But remember, even if it looks a little intimidating at first, you will thank yourself for making these changes later. And besides, there are still many things that you can eat on the Paleo diet. 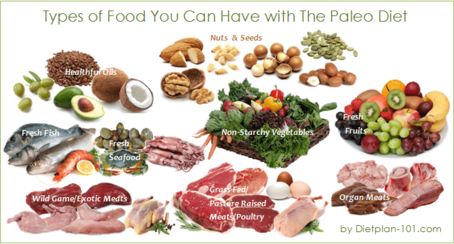 Remember, these are just a few of the delicious foods that you can have on a Paleo diet. Once you start to eat clean you will discover that your whole world is going to change. The Paleo diet is going to fill your body with maximum protein. Because of this, you will be able to literally turn your body into a fat blasting machine. All of that protein will literally be fueling your body every day all day long and you will start losing weight effortlessly. But that doesn’t mean that you can’t lose weight even faster. Think about it, if you are having such great results from a few meal changes how great will your results be if you have meal changes and a good workout plan? Whether you realize it or not just eating a Paleo diet is increasing your ability to handle a workout routine. Remember, the creators of the Paleo diet were the hunter-gatherers who were forced to rely on good food choices to fuel their bodies and help them stay alive. The foods that you eat have a direct affect on your ability to exercise. If you eat a diet full of processed foods, will you still be able to get through a rigorous exercise routine? Sure, if you are used to exercising every day and you build up your body. The beauty of the Paleo diet is that working out does not have to be hard. And unlike most other diets you don’t have to buy certain equipment or DVDs in order to maximize your Paleo results. Finding the right exercise routine for you is literally as easy as thinking like a caveman. Think about what a day in the life of a caveman would have been like, imagine if you were a hunter-gatherer and think about the things you would be responsible for. Next, you want to think about what muscles those hunter-gatherers would have used. Obviously the main thing is a lot of cardio, so a good idea would be for you to start there. This doesn’t have to be hard on your body, you can go for a quick walk or an easy jog if you want. Anything to start to get your heartrate up. Remember, if you are eating a diet rich in Paleo foods, you will find that it is much easier to get through any kind of cardio routine. Okay, after cardio what would a caveman have done? For instance, they probably would have had to lift heavy items, so you might want to consider doing a little bit of weight lifting. They most likely also had to do a lot of squatting when they were hunting prey, lifting large objects, or balancing on uneven terrain. So maybe you might want to think about adding some squats to your exercise routine. Eating like a hunter-gatherer is going to change your life. Not only will you be able to have the body that you have always dreamed of having, but you will also be able to live a truly healthy lifestyle and sleep well at night knowing that you are doing something good for your body. Your family can also be a part of the Paleo diet. A diet rich in Paleo foods are good for children and adults alike. After all, so much of the Paleo diet focuses around eating fruits, vegetables, and natural foods that come straight from the earth. Imagine what your life is going to be like when you don’t have to worry about counting calories or watching what you eat anymore. Think about what it would be like if you woke up in the morning, made yourself some breakfast, packed a lunch and did not have to stress about portion control or eating certain foods at a specific time. Think about how freeing it would be to have a list of foods that are good for your body and simply stick to that list every day. And remember, these aren’t foods that you will have to adjust to, a Paleo diet is rich in the foods that you are likely eating right now anyway. And as if all of these benefits weren’t enough, when you are eating a Paleo diet, you are going to be seeing massive changes in your body. Even without exercise, all of protein that is offered on the Paleo diet is going to literally turn your body into a fat burning machine. You will literally be burning fat almost every second of every day without any effort. How amazing is that? And underneath all of that fat you will find long and lean muscles, another benefit of having a good amount of protein in your diet. Finding your path to true health does not have to be hard. When you are eating the way that you were designed to eat you will see a difference, feel a difference, and have the life that you could only have imagined.